Our mobile phone plays a big role in our life today not only for communication but also to our transactions online like banking, shopping and more. More often than not, it takes more time, effort and mostly money (load) to process. But today a partnership between PLDT's digital unit and the biggest brands of the country will make our life more easier and safer. 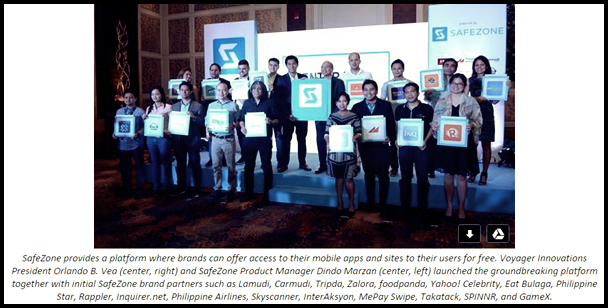 Voyager Innovations Incorporation, the digital unit of Philippine Long Distance Telecommunications (PLDT) Group, recently launched SafeZone, a groundbreaking platform that will allow brands and businesses to easily reach their customers nationwide through their mobile phones. Bank of the Philippine Island (BPI) - You can now transact easily and conveniently on your BPI account with BPI Express Mobile app, where you can bank anytime and anywhere. Agoda - An onlie accommodation reservations company, which specializes in securing the lowest discount in hotels worldwide. Inquirer - the latest in news and current events in Inquirer Mobile. Skyscanner - global travel search of flights, hotels and car hire. Zalora - an online shopping site and one of the country's leading online retailer. Carmudi - world's fastest growing car classified with over 300, 000 cars, motorcycles and commercial vehicle from trusted sellers. Lamudi - An app that will find your perfect match for house, apartment or commercial property, through rent or buy. SPINNR - listen and get your favorite music or songs and join raffles to the biggest concerts in the contry. 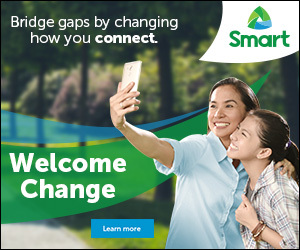 GAME X - a portal that enables gamers to pay for gaming ePins using their SMART prepaid load or postpaid bill. Philippine Airlines - find and book your flight on your mobile phones. Babble Messenger - a real time mobile messaging app which allows you to send unlimited messages for FREE. Eat Bulaga - Experience "Isang Libo't, Isang Tuwa" delivered by the Philippines' longest running television show on your mobile phone with the new Eat Bulaga Mobile app. 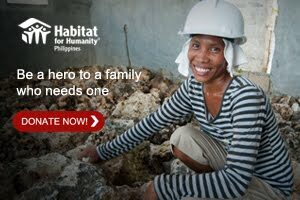 Other partners that will be added soon are Philippines Star, InterAksyon, Yahoo! Celebrity, Takatack, Tripda and FoodPanda. More and more partners will be on the list just watch out for it. Finally, you can also access your favorite social media accounts like Facebook, Twitter and Instagram within SafeZone, FREE of charge. All you have to do is to link your social media accounts through the SafeZone Social page in order to post, like, tweet, favorite and comment on social media posts. Isn't it awesome, all that for FREE, just visit www.safezone.ph to start to be on the zone of Safe and Free :). Once your in the SafeZone don't forget to "turn ON" the Load Protect button to make sure you do not charged for accessing other mobile apps and sites that are not part of SafeZone. This services also be available soon to Sun Cellular subscribers.